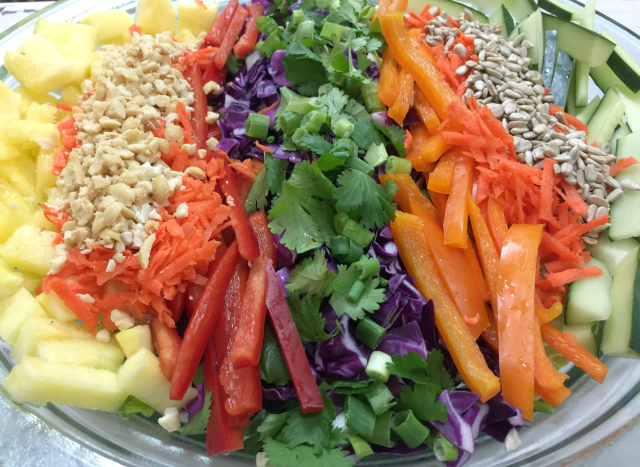 Crunchy Thai Salad is my go-to dish when we are invited to dinner, a BBQ or potluck. 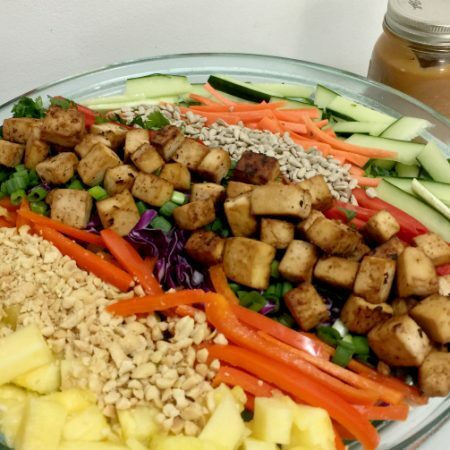 It’s the dish referred to as “that salad you make.” A homemade dressing that takes just a couple of minutes, a brilliantly colored salad with lots of vegetables and a bit of fruit plus baked tofu on top that has converted more than a few who said they didn’t like tofu. 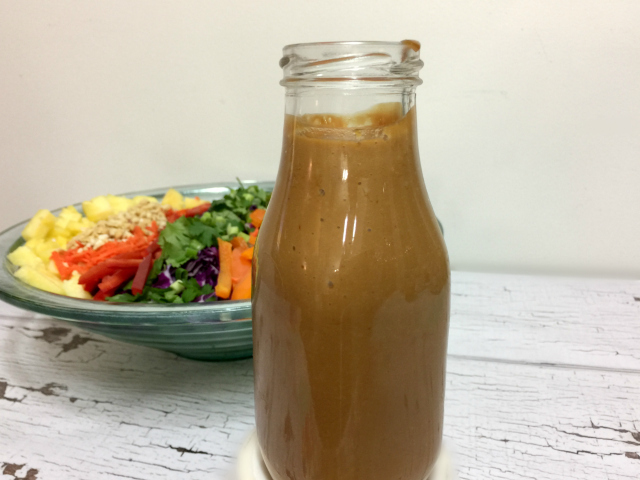 Earlier this week I shared the salad dressing recipe. It’s creamy, has a tiny touch of heat and can also be used as a dip. You’ll love this dressing. 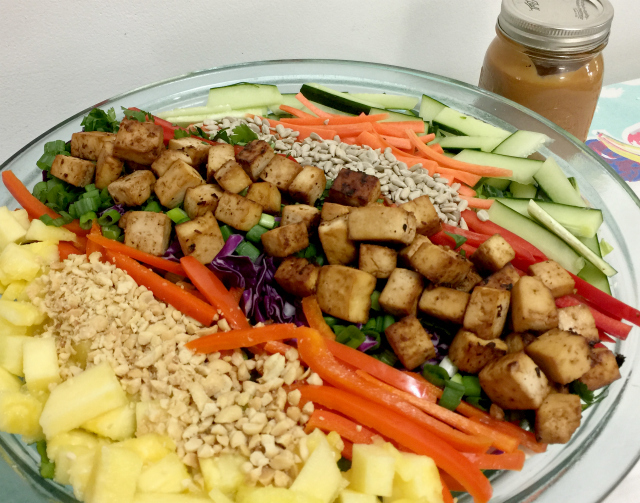 It’s one we make nearly ever week for salads, spring rolls and Buddha bowls. I also shared the recipe for Baked Peanut Tofu. I hear all the time, “I don’t care for tofu” or “I tried to make tofu once and it was a disaster.” It doesn’t have to be that way. I’ve shared tips in the post with the recipe on how to make tofu that is gobbled up by meat eaters. 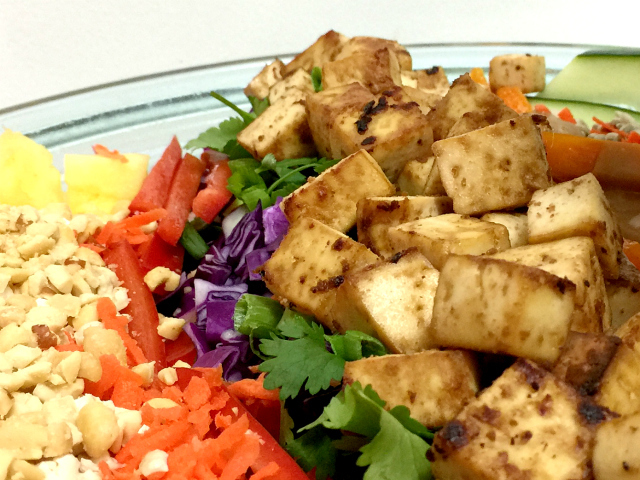 That said, if tofu is not your deal, top this salad with whatever protein speaks to you. You can even use the marinade recipe I shared but use it on whatever meat-y thing you like to eat. Or enjoy the salad without tofu or meat. It’s great any way you choose to have it! Let’s walk through how I make this salad. First, marinate the tofu. Second, make the dressing. Third, bake the tofu. Fourth, chop up the vegetables and fruit while tofu is baking. You’ll need a lovely salad bowl for this. I have a beautiful seaglass-color bowl I brought home from a trip to St. Pete Beach that seems to photograph as a boring old glass bowl. 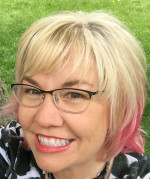 Maybe I have memories of a beautiful beach vacation when I see. Who knows. Anyhow, use your favorite pretty bowl! 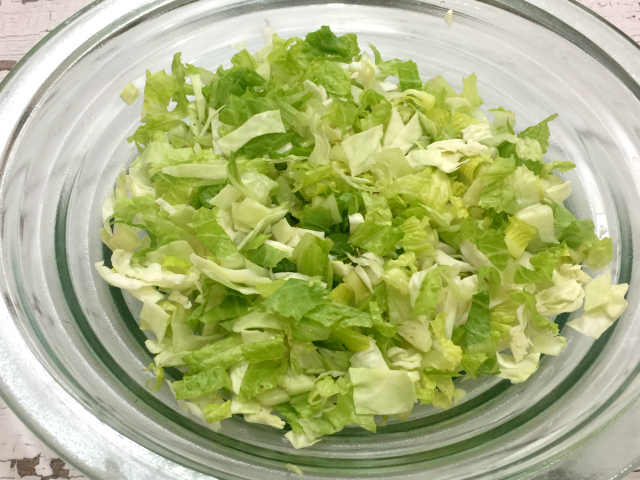 First, I put the romaine and green cabbage in the bowl and toss them together. 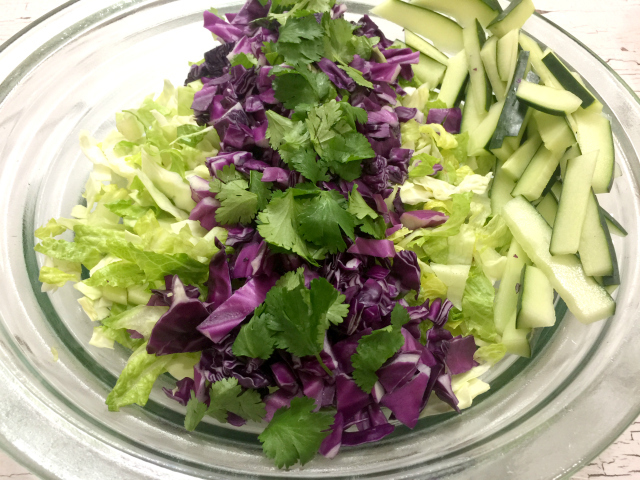 Next, I add the red cabbage in a pretty line down the center and top with cilantro, cucumbers around one edge, maybe pineapple around the other. Then I lay all of the remaining vegetables out in pretty lines, finishing with chopped peanuts and sunflower seeds. It’s a thing of beauty, this crunchy salad. I have served this with dressing on the side when it’s for a crowd. When we eat it at home, we toss dressing into the whole salad. While this would easily serve six as a side, it make four very generous entree size salads. 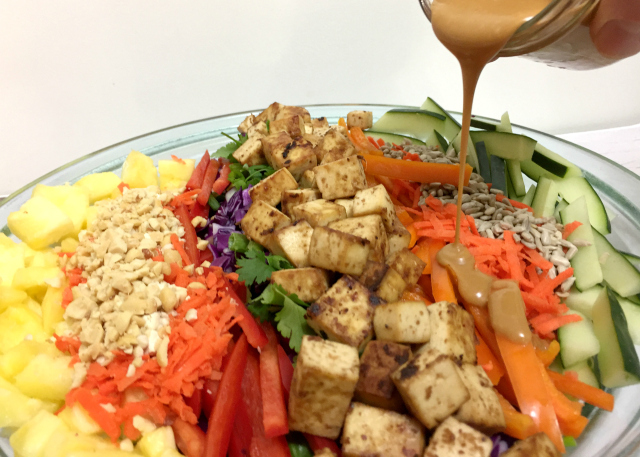 Make Salad Dressing and Baked Peanut Tofu in advance. Chop all vegetables, fruit and peanuts according to recipe instructions. Place cooled tofu atop salad last. Serve with dressing on the side or toss dressing into salad if you prefer.